Modern shark researchers have access to a variety of high-tech tools. Acoustic tags with noises specific to each individual shark signal a receiver (or network of receivers) every time the shark passes nearby. Some tags have three-dimensional accelerometers, allowing researchers to study the small scale movement patterns and behaviors of sharks. Others, which are placed in the stomach, measure pH before, during, and after digestion. The most advanced technology on the market, however, is undoubtedly the satellite tag. 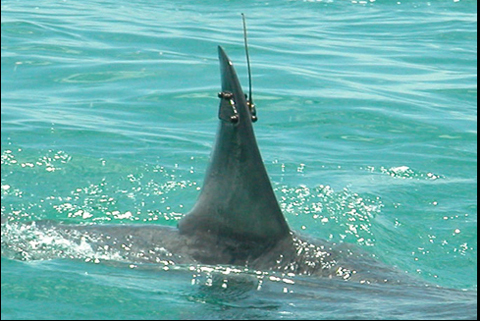 Satellite tags are usually mounted to the shark’s dorsal fin. One type of tag, used on species that often spend their time near the surface (i.e. great whites, whale sharks, etc) transmits data to orbiting satellites whenever the tag breaks the surface. Another type, known as a pop-up tag, is used on species unlikely to visit the surface. Instead, pop-up tags detach from the shark after a pre-programmed amount of time, float to the surface, and transmit all their data at once. Satellite tags can record a variety of different kinds of data, including location, water temperature, and depth. Depending on how many sensors are involved, the cost per tag can be several thousand dollars. This can generate important data concerning sharks’ migration patterns, feeding behaviors, and habitat requirements. If they work properly (always a big “if” when dealing with new technology), they can record and transmit data for months or even years. Though this kind of research can generate headlines (such as the tracking of Nicole, the great white shark who swam from South Africa to Australia and the discovery that basking sharks migrate from New England to South America), it often isn’t really hypothesis testing. Shark scientist Dr. Chris Lowe refers to such studies as “shiny new hammer” science- in essence, researchers have a shiny new hammer and they are trying to hit as many nails as they can with it without first thinking about what the best way to use that hammer is. In a review of shark satellite tagging studies, Dr. Neil Hammerschlag referenced such studies as attempting to “‘see what the sharks do’ or ‘where they go'”. According to Dr. Hammerschlag’s review, 48 studies to date have used satellite tags to study sharks and most qualify as “shiny new hammer” science. These have focused on 17 species, though half of them have involved just three species (great white sharks, whale sharks, and basking sharks). Approximately 10% of tags failed, and 39 out of these 48 studies had at least one tag that didn’t work properly, which should be taken into account by anyone planning to use this expensive technology in their own research. The review also noted that the color of the tags can have a major impact on the behavior of the tagged sharks- animals that rely on stealth to hunt are disadvantaged by a piece of bright orange plastic sticking to them. The data gathered by “shiny new hammer” research can be incredibly useful to the science and conservation community- improved knowledge of migration paths can aid conservation policymakers. That said, using this technology to test hypotheses and answer important questions would be more valuable than using it for this kind of data collection and I hope to see more of that in the future. I wish we’d got to that point too, but even for one of the better studied species, whale sharks, we still have only a handful of data points. One thng that would really help would be better integration of efforts by different research groups. 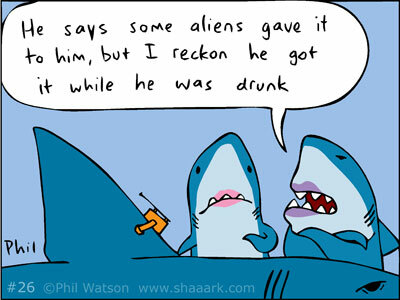 I’m sure that applies to other shark species as well. Every tag return is a new part of the story, but nothing helps like context! I disagree that hypothesis testing is inherently more valuable than observational/descriptive research. The two go hand in hand – you observe/describe as much as possible and then (ideally) use those observations to test hypotheses to answer questions that cannot be addressed through observation. The goal is to make new discoveries and answer questions about the world in whatever way you can. “Shiny new microscopes” would be a more appropriate metaphor for these devices because they allow us to observe things in a way that wasn’t previously possible. What should a good scientist do with a tool like this? Van Leeuwenhoek didn’t sit around ruminating about hypotheses. He took his new microscope and looked at every damn thing he could put under it! Were his observations not valuable? Having said that, once it’s established that animals have cells, we don’t need a new publication from everybody who uses the microscope and finds that their animal also has cells. -and that may be where we’ve gotten with some satellite tag studies. But I wouldn’t fault anyone for wanting to use that “microscope” to see if it reveals something new and surprising about their animal. It often does – especially in the early days when the microscope is especially shiny. Have I exhausted this metaphor yet?